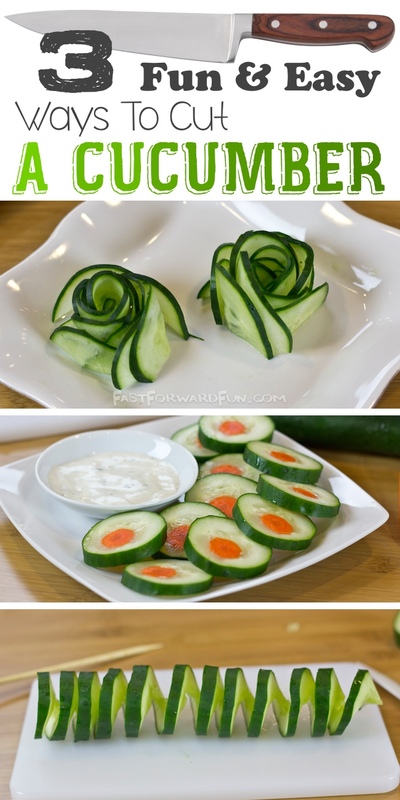 Who knew cucumbers could be so much fun!? They’re actually quite the versatile veggie, making snacks and appetizers more appealing even for the little ones. With just a few cuts of the knife (and a few other tricks up our sleeve), you can make cucumbers your new favorite snack. 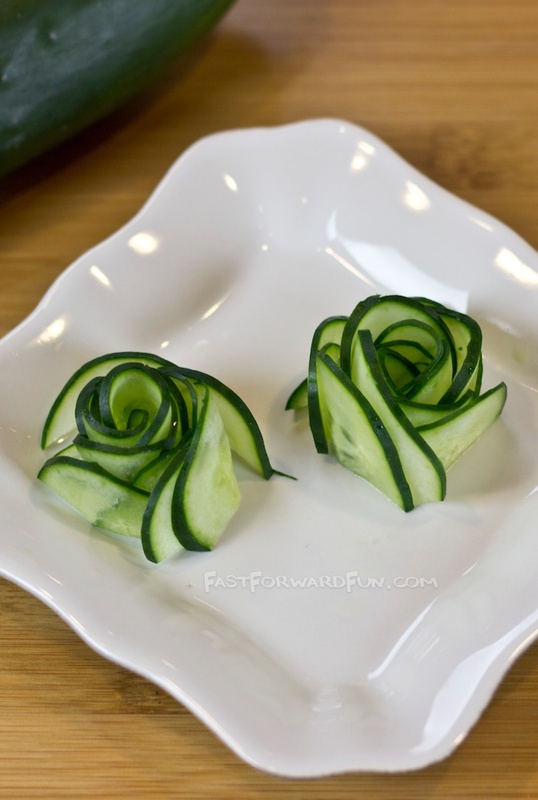 Best of all, these decorative cucumber cutting tricks are carefully crammed in a one minute video tutorial. Trust me, they’re easy enough for just about anyone to do, and they look super fancy on an appetizer tray or as a garnish to any dish. Want to be a hero at the next party? 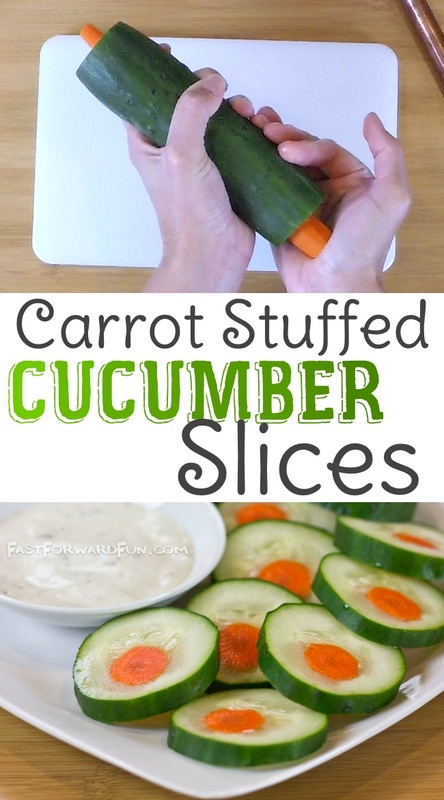 Bring a veggie appetizer tray with these carrot stuffed cucumber slices and your favorite ranch for dipping. They may look complicated, but once you have the supplies, you will want to make them over and over. We used copper tubing that we found in the plumbing department of Home Depot, cut it down to about 14 inches, washed it with our makeshift pipe cleaner (a plastic straw wrapped in pipe cleaners that we found in our daughter’s craft drawer), and used it to hollow out the center of a cucumber. ***A large, thick plastic straw might also do the trick (the inside of the cucumber is mushier than you’d think). 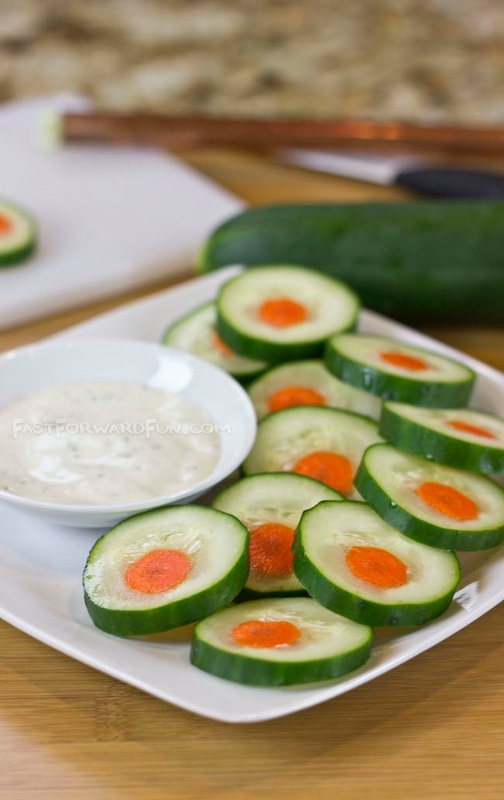 *** Next, wash and peel a long, thin carrot, stuff it inside of the cucumber, and then cut coin shaped slices to reveal your impressive carrot stuffed cucumber rounds! Serve with ranch for dipping. Tasty. My kids love this! If you have a hard time getting your kiddos to eat their veggies, try this trick the next time you pack their lunch. 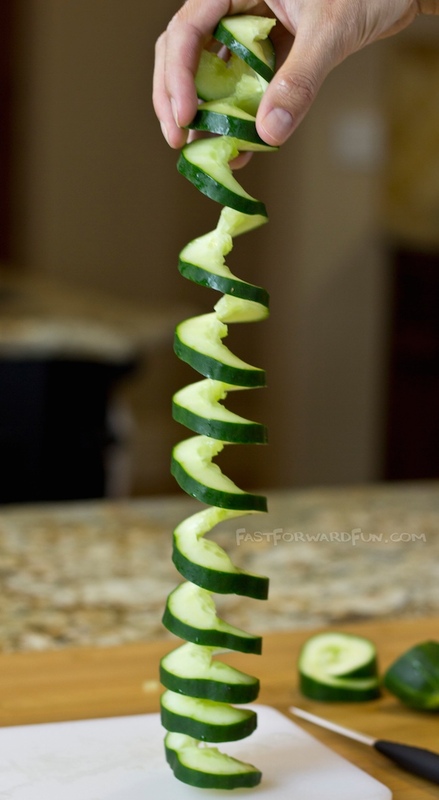 You really can’t go wrong with a cucumber slinky. 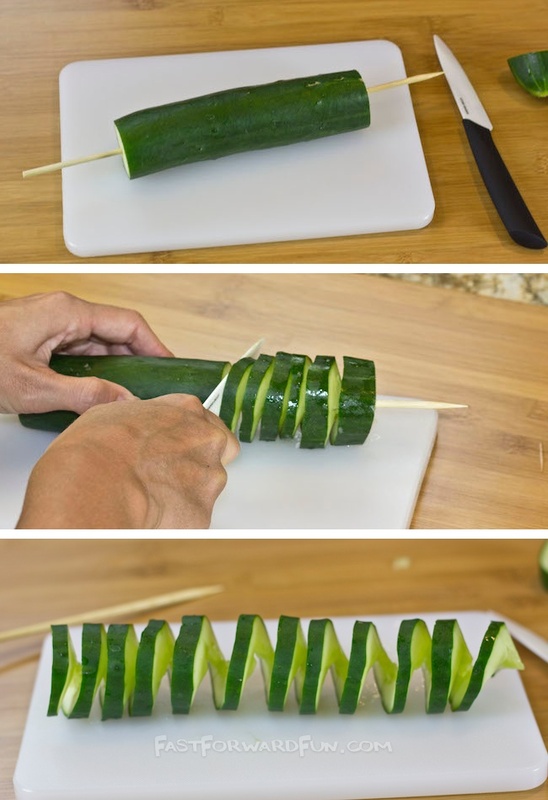 After cutting off the ends of a cucumber, stick a wooden skewer directly through the center. Starting at an angle on one end, use a sharp knife to slice as evenly around as possible until you get to the end (I’d recommend watching the video for this one). Pull the skewer out, and enjoy your edible slinky. Add this as a garnish to any dish to knock the sock off of your guests. 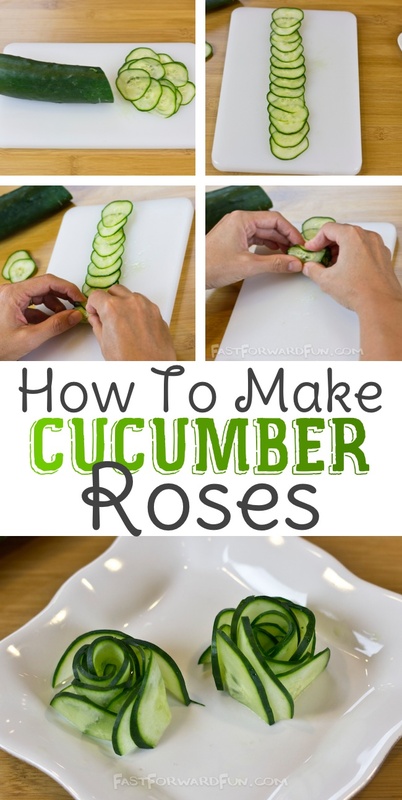 First, take a large cucumber and cut about 14 really thin slices. Stack them partially on top of each other to create a line. 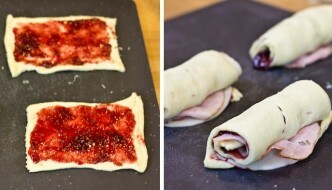 Carefully roll the slices all the way up, cut in half, and then place them on your dish with the flat side down. You may have to adjust the “petals” a bit to make it pretty. 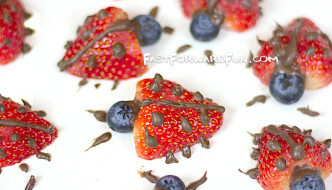 These look adorable served with sushi, placed on top of a salad, or as a garnish on a snack plate. I also like to add a few to a vegetable party tray to fancy it up a bit.